important thing in life is to find this treasure, and then to share it with other people and with all beings. In order to have peace and joy, you must succeed in having peace within each of your steps. Your steps are the most important thing. They decide everything. I am lighting a stick of incense and joining my palms together as a lotus bud to pray for your success. Walking meditation is practicing meditation while walking. It can bring you joy and peace while you practice it. Take short steps in complete relaxation; go slowly with a smile on your lips, with your heart open to an experience of peace. You can feel truly at ease with yourself. Your steps can be those of the healthiest, most secure person on earth. All sorrows and worries can drop away while you are walking. To have peace of mind, to attain self-liberation, learn to walk in this way. It is not difficult. You can do it. Anyone can do it who has some degree of mindfulness and a true intention to be happy. In our daily lives, we usually feel pressured to move ahead. We have to hurry. We seldom ask ourselves where it is that we must hurry to. When you practice walking meditation, you go for a stroll. You have no purpose or direction in space or time. The purpose of walking meditation is walking meditation itself. Going is important, not arriving. Walking meditation is not a means to an end; it is an end. Each step is life; each step is peace and joy. That is why we don’t have to hurry. That is why we slow down. We seem to move forward, but we don’t go anywhere; we are not drawn by a goal. Thus we smile while we are walking. Our earth is truly beautiful. There is so much graceful, natural scenery along paths and roads around the earth! Do you know how many dirt lanes there are, lined with bamboo, or winding around scented rice fields? Do you know how many forest paths there are, paved with colorful leaves, offering cool and shade? They are all available to us, yet we cannotenjoy them because our hearts are not trouble-free, and our steps are not at ease. Walking meditation is learning to walk again with ease. When you were about a year old, you began to walk with tottering steps. Now, in practicing walking meditation you are learning to walk again. However, after a few weeks of practice, you will be able to step solidly, in peace and comfort. I am writing these lines to assist you in doing that. I wish you success. learn to let go – let go of your sorrows, let go of your worries. That is the secret of walking meditation. To have peace and joy and inner freedom, you need to learn how to let go of your sorrows and worries, the elements that create unhappiness. First of all, notice that this world contains all the wonders you could expect to find in the Buddha Land. It is only because of our veil of sorrows and worries that we cannot always see these wonders. I always think that I like this world even better than I would the Pure Land because I like what this world offers: lemon trees, orange trees, banana trees, pine trees, apricot trees, and willow trees. Some people say that in the Pure Land there are valuable lotus ponds, seven-gem trees, and roads paved with gold, and that there are special celestial birds. I don’t think I would like these very much. I would rather not walk on roads paved with gold and silver. I wouldn’t even use roads that were lined with marble here on earth. Dirt roads with meadows on both sides are my favorite; I love pebbles and leaves covering the ground. I love bushes, streams, bamboo fences, and ferries. When I was a young novice, I told my Master, ‘If the Pure Land doesn’t have lemon trees, then I don’t want to go.’ He shook his head and smiled. Maybe he thought I was a stubborn youngster. However, he did not say that I was right or wrong. Later when I realized that both the world and the Pure Land come from the mind, I was very happy. I was happy since I knew that lemon trees and star-fruit trees exist also in the Pure Land, with dirt roads and green grass on all sides. I knew that if I kept my eyes open in mindfulness and my steps at ease, I could find my Pure Land. That is why I do not let a single day pass without practicing walking meditation. It is best if the road is not too rough or too steep. Slow down and concentrate on your steps. Be aware of each move. Walk straight ahead with dignity, calm, and comfort. Consciously make an imprint on the ground as you step. Walk as the Buddha would. Place your foot on the surface of the earth the way an emperor would place his seal on a royal decree. A royal decree can bring happiness or misery to people. It can shower grace on them or it can ruin their lives. Your steps can do the same. If your steps are peaceful, the world will have peace. If you can take one peaceful step, you can take two. You can take one hundred and eight peaceful steps. When an artist or a sculptor creates a picture or a statue of Buddha sitting upon a lotus flower, it is not just to express his reverence towards the Buddha. The artist must above all want to show the Buddha’s state of mind as he sits: the state of complete peace, complete bliss. We all sit several times a day, but few of us can sit in peace and with ease, few of us can sit majestically like the Buddha. Most of us get restless after a while, as if we were sitting on hot coals. The Buddha may sit on the grass or on a rock, but he looks as serene as he would look sitting on a lotus flower. When I first entered the monastery, my master taught me to observe this thought just before sitting: ‘Sitting with my back straight, I wish all beings may be seated on the platform of enlightenment, their hearts freed from all illusion and mistaken views.’ Only after I said that would I slowly sit down. That is the way to learn to sit like a Buddha. a lotus flower to appear in each of his footsteps. We should all cause a lotus flower to bloom with each of our peaceful steps. Next time you practice walking meditation, please try visualizing a lotus flower opening as your feet touch the ground, like a newborn Buddha. Don’t feel unworthy of this vision. If your steps are serene, they are worthy of this flowering. You are a Buddha, and so is everyone else. I didn’t make that up. It was the Buddha himself who said so. He said that all beings had the potential to become awakened. 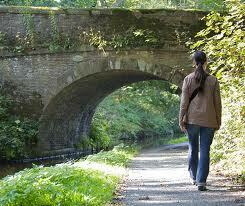 To practice walking meditation is to practice living in mindfulness. Mindfulness and enlightenment are one. Enlightenment leads to mindfulness and mindfulness leads to enlightenment. Walking with ease and with peace of mind on the earth is a wonderful miracle. Some people say that only walking on burning coals or walking on spikes or on water are miracles, but I find that simply walking on the earth is a miracle. Neige Marchand, when translating The Miracle of Mindfulness into French, entitled the book La Miracle, C’est de Marcher sur Terre. I like that title very much. Imagine that you and I were two astronauts. We have landed on the moon, and we find that we cannot return to earth because the engine of our ship is broken beyond repair. We will run out of oxygen before the control center on earth can send another ship up to rescue us. We know that we have only two more days to live. What would you and I think of, other than going back to our dear green planet and walking side by side, in peace and without worries? Only when confronted with death do we know the precious value of our steps on the green planet. Now let’s imagine ourselves as those astronauts who have somehow survived their xperience. Let’s celebrate our happiness and our joy at being able to walk on our dear earth again. We manifest this miracle in each of our steps. Lotus flowers bloom as we walk. Maintain your practice, aware that your steps are creating miracles. The earth appears before your eyes as something miraculous. With that correct understanding, with that meditative thought, you will achieve blissful steps on this planet earth. Stand on one foot, and be aware that it is resting upon the earth; see the great sphere upon which it rests. See it clearly – how wonderfully round it is. While walking, look down and anticipate the ground where you are about to place your foot, and when you do, mindfully experience your foot, the ground, and the connection between your foot and the ground. Think of your foot as an Emperor’s seal. In the meditation hall, while doing kinhin (walking meditation) remember ‘The Emperor’s Seal’, or ‘Lotus flowers blooming’, or ‘The earth appears’ as themes of your walking meditation.